It will take roughly $810 million of new catastrophe bond issuance in the final quarter of 2016 to see the market grow from the end of the third-quarter, while just a slightly above-average level of Q4 issuance would see the outstanding cat bond market end 2016 at its largest ever size. 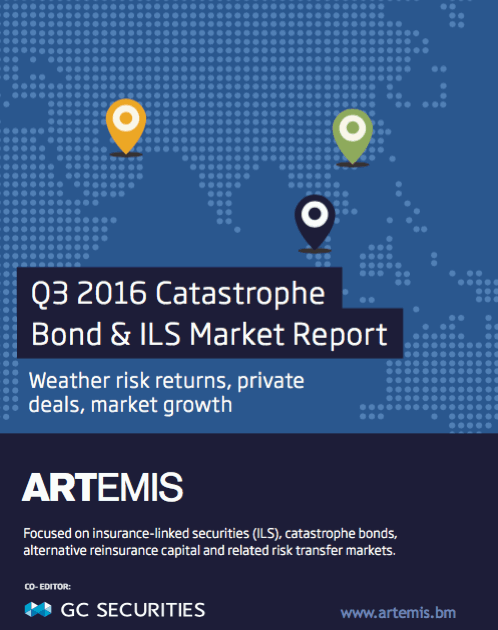 The Artemis Q3 2016 Catastrophe Bond & insurance-linked securities (ILS) Market Report shows that the market size at the end of the third-quarter was an impressive $25.449 billion, as issuance levels exceeded $1 billion, just the fourth time this has happened in any third-quarter since the market’s inception. As recorded by the Artemis Deal Directory and revealed in the Artemis Q1 2016 Cat bond & ILS Market Report, the largest the outstanding market has ever been at the end of a quarter is $26.516 billion, which occurred at the end of Q1 after a record-breaking $2.215 billion of new risk capital came to market. Five transactions consisting of eight tranches of notes are scheduled to mature in the final three months of the year, combining to result in $809.43 million of scheduled maturities. As a result of this, it will take roughly $810 million+ of new risk capital issuance to see the outstanding cat bond and ILS market grow from the end of the third-quarter. Analysis shows that of the last ten-years (2006 – 2015), all but one (2008, which saw no deals come to market in Q4) fourth-quarter has seen issuance surpass the $1 billion threshold, which suggests it’s likely that the market will achieve growth once again in the final months of 2016. Interestingly, four fourth-quarters since 2006 have seen issuance levels exceed the $2 billion mark, taking the average Q4 issuance volume of the last decade to approximately $1.72 billion. With this in mind, were issuance in the final quarter of 2016 to be only slightly above the ten-year average, with roughly $1.88 billion of issuance needed, then the market would end 2016 at its largest ever size, beyond the $26.516 billion recorded at the end of Q1 2016. Despite $809.43 million of scheduled maturities, an average volume of issuance in the fourth-quarter, or indeed a slightly below-average volume of issuance would still see the market end 2016 beyond the $26 billion threshold, an impressive milestone for the sector first breached at the end of the first-quarter of this year. After a record-breaking first-quarter of catastrophe bond issuance the market slowed down in Q2, and reports across the ILS sector noted a rise in collateralized reinsurance placements over cat bond sector growth. Current market conditions could be part of the reason for sponsors and investors opting for the collateralised reinsurance route instead of issuing a cat bond, but while the second and third-quarter failed to break any records, there is every chance the cat bond space could still reach its largest ever size at the end of 2016. With this in mind, it would be impressive for the market to continue growing during such testing times for the global re/insurance industry, and would suggest that investors are still attracted to the diversifying and uncorrelated benefits of the space, in spite of lower returns. It will be interesting to see how much new risk capital is issued during the fourth-quarter of 2016 and whether investor and sponsor appetite is enough to see the outstanding cat bond & ILS market end 2016 at its largest ever size, above the $26.516 billion recorded at the end of March 2016. Just this morning we covered prolific cat bond sponsor USAA and the launch of its latest Residential Re transaction, which promises to contribute at least $280 million to 2016 issuance. It’s a good start to Q4 issuance but there is still some way to go to reach the $1.88 billion of new cat bonds required to see the market reach a new record size. Below is a list of the deals that are scheduled to mature in the fourth-quarter of 2016, as recorded by the Artemis Deal Directory. Mythen Re Ltd. (series 2012-2), Queen City Re Ltd. (Series 2013-1), Residential Reinsurance 2012 Ltd. (Series 2012-2), Armor Re Ltd. (Series 2014-1), and Windmill I Re Ltd. (Series 2013-1).